Thanks to various tv garden make-over programmes, people are now aware that a garden is far more than the space directly outside your door, but an extension of your home in which you can relax, entertain and play. The design process begins with a free consultation and site visit to discuss your requirements. You may wish for a patio for summer barbeques or to extend your driveway to accommodate two cars. You may need to replace your fence that has blown down in the wind or give your property kerb appeal! We will discuss your vision and combine it with my advice and suggestions. We will always discuss ways for you to reduce the cost of the work by recycling existing materials and plants and improving rather than replacing elements. “Form follows function” in all good design. This applies to the design of your garden too. The practicalities of what you want to use your garden for should be paramount and then we can make it beautiful. Simple things like where the bins are going to be stored and where you can hose the dog off are often overlooked. With the information provided by you and a survey of the site, I will draw a free annotated design plan of the area and quotation for the work. 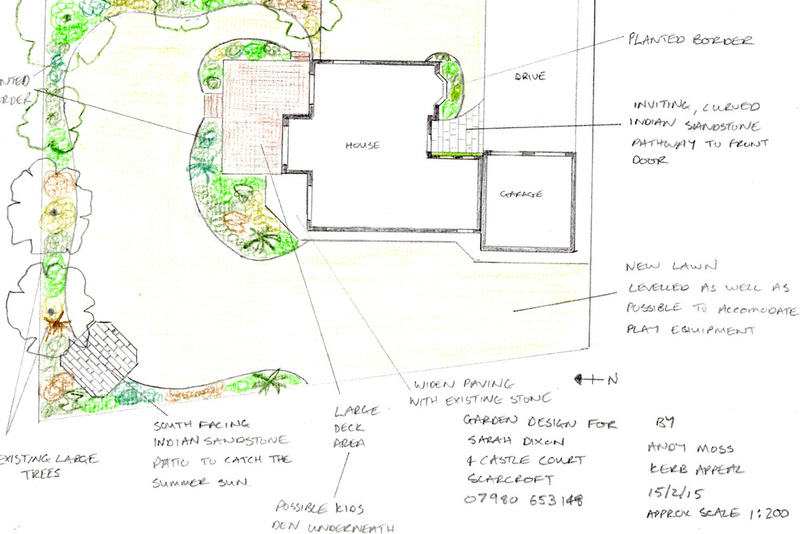 Although I can produce full colour, detailed designs for your garden, I do believe they are an unnecessary expense. Gardens evolve as you create them and in my experience, never end up exactly like the plan. Unexpected problems like buried man holes and shallow pipe work means that the design has to change as we go along, but this is part of the fun!